With the rapid growth in the number of cyber-attacks, the demand for strict acquiescence and security packages to protect confidential data across different verticals, such as government, banking, retail, manufacturing, etc., is increasing. This factor is expected to drive the growth of the market over the forecast period. According to the Asia-Pacific Economic Cooperation, small and medium enterprises (SMEs) are the engines of growth and innovation in region, and account for over 97% of all enterprises and employ over half of the workforce across Asia-Pacific economies. The growing penetration of the internet and shift toward digitization of the internal processes have been instrumental in driving the adoption of cloud-based services. Alongside the digital transformation in the region, owing to ineffective cyber laws and lack of cyber security awareness, companies in Asia-Pacific have been found to be 80% more likely to be targeted by hackers as compared to other regions. Further, the growing speed and scope of digital transformation in the region, coupled with the advent of IoT, are leading to the existing network infrastructure being increasingly vulnerable to cyber-attacks. With growing technological penetration, digital channels (such as internet banking, mobile banking, etc.) are becoming the preferred choice of customers for banking services. Consequentially, the amount data volumes has witnessed a robust increase. To utilize this data to gather customer insights, banks and financial organizations are increasingly employing services. BFSI institutes have therefore opted for cloud solutions, to increase the ease in storage and analysis of complex data. However, the growing number of data breaches has led to an exponential rise in costs and loss of valuable customer information. 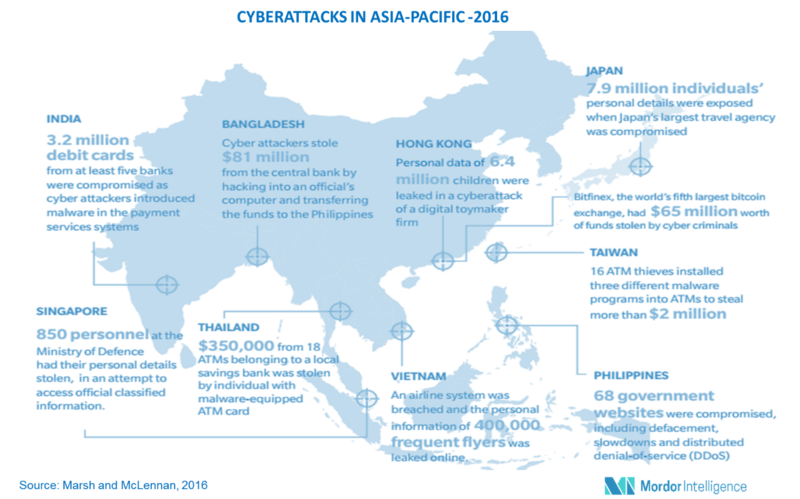 For instance, in the recent past, Taiwan’s Far Eastern International Bank incurred a loss of around USD 60 million by a malware. In addition, with greater customer expectation, growing technological capabilities, and regulatory requirements, banking institutions are pushed to adopt a proactive approach to security. While enterprises have pushed consistently to meet the challenge of anticipating future demands by adopting cloud-based services, the number of attacks on cloud environments has also increased, which has threated and challenged the traditional IT infrastructure. The increase in the number of attacks can also be attributed to the fact that more valuable data is shifting to the cloud, and hackers find it lucrative to steal valuable data. Thus, it has become increasingly important for organizations to step up security systems, to protect their cloud environments. January 2018 - IBM and Salesforce expanded their partnership, by bringing together artificial intelligence and cloud computing platforms. This partnership is expected to expand IBM’s customer base in the cloud solutions segment. January 2018 - Amazon's cloud business acquired Sqrrl, a security start-up with NSA roots. The founders of Sqrrl had previously worked for the US National Security Agency. This acquisition by the company is aimed at attaining business from US intelligence agencies. July 2017 - IBM announced the launch of two new security testing practice areas, focused on automotive security and Internet of Things (IoT). The new services will be delivered via an elite team of IBM X-Force Red researchers, focused on testing backend processes, apps, and physical hardware, used to control access and management of smart systems. Major Players: IBM Inc., Fortinet Technologies Inc., Porticor Ltd, Intel Security Group, Mcafee Inc., Oracle Pvt. Ltd, Imperva Inc., Netlib Security Inc., Hexatier Ltd, The Hewlett-Packard Company, Trustwave Holdings, Informatica Corporation, Voltage Security Inc., Amazon Web Services, And Axis Technology LLC, amongst others. Understanding how the growing number of cyber-attacks acts as a driver of the global market scenario. The solutions and end-user verticals that are expected to dominate the market.